In 1949, on the occasion of the 100th anniversary of the first French postage stamp, a group of British philatelists set up a pioneering specialist philatelic society devoted to the study of the stamps of France and the then French Empire. From small beginnings, the France and Colonies Philatelic Society now unites over 300 collectors in Britain and overseas in the many and varied delights of the stamps and postal history of la Francophonie. The Society provides an extensive programme of meetings in several locations, holds an annual Philatelic Weekend, publishes a well regarded and authoritative Journal and series of monographs as well as several more extensive specialist philatelic books, operates a magazine circuit, two thriving exchange packets and three postal Auctions a year. It is a friendly and informal group to which non-members are welcome to attend any of our meetings. This year we mark yet another major step in the life of our Society as we celebrate the 70th anniversary of its launching in 1949. The ‘offcial’ celebration of our platinum anniversary took place after the AGM held at Charlecote on 2nd March. If you were unable to attend the celebration please free feel to pour yourself a glass of champagne and toast the Society’s health in your own armchair. Our longest standing member George Nash (N° 30) was invited to contribute to the Journal's anniversary edition as has Bill Mitchell (N° 50), who likewise contributed an article. Bill served the Society for many years as Auction Secretary and has been a regular contributor to the Journal and this has been recognised by being presented with the Long Service Award. Another bumper auction. Please note that postal history and stamps (the main categories) appear in several sections so do read the full catalogue. Unusually strong in taxe stamps this auction, some good early postal history, much at quite low reserves, plus some first flights which we haven’t had for some time. Enjoy! A reminder that unsold lots are posted on the website a week after auction closes. Send your surplus material for sale to Steve Ellis: less common items particularly likely to sell.. Lots are available to Members Only. Application for membership is available here. AUCTION CATALOGUE available here. Pro ducing the Journal for the France & Colonies Philatelic Society is an extremely rewarding job especially for someone who enjoys creative work on the computer. Who amongst us does not experience satisfaction and a touch of pride upon the completion of an attractive page of writing-up on which our stamps and covers can then be mounted? Working with text and images to create the Journal and using the same skills as when writing up a page of stamps can be equally fulfilling but, of course, it will be on a larger scale. We are looking therefore for someone who can commit themselves to producing three Journals a year. Currently the Journal is published using InDesign software but it could equally be produced using another desktop publishing programme or by someone with moderate Word skills; the choice would be that of the applicant based on a system with which they feel both familiar and confident. A broad awareness of French philately would be useful but in-depth knowledge is not essential. If there are problems concerning the specialised content of articles there are members who can be called upon to give assistance. 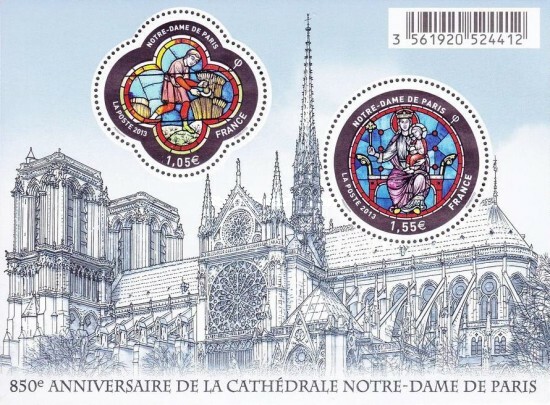 Souvenir sheet commemorating the 850th anniversary of the Notre-Dame Cathedral of Paris. France Post issued this sheet on the 19th of January 2013.The background shows the cathedral viewed from the Seine. The two stamps show details of the stained glass window located in the west. The quatrefoil stamp illustrates the threshing of cereals and the circular stamp features the Blessed Virgin and Child. It is recorded in the Memoriale Historiarum that the construction of Notre-Dame began between 24 March and 25 April 1163 with the laying of the cornerstone in the presence of King Louis VII and Pope Alexander III. The Notre-Dame Cathedral is built in the Gothic style, facing the rising sun in the East, in the form of a cross. Notre-Dame measures 130 meters long, 48 wide, 35 high and can accommodate over 6000 people. While undergoing renovation and restoration, the Notre-Dame de Paris caught fire on 15 April 2019 and sustained significant damage, including the destruction of two-thirds of the roof and the spire. Artwork, relics, and other antiques stored at the cathedral including the supposed crown of thorns which Jesus wore prior to his crucifixion and a piece of the cross on which he was crucified, are believed to have been rescued, however, other priceless pieces of historyincluding one of the finest organs in the world and a collection of bells, some of which were renovated at the 850th anniversary of the cathedral. have been damaged or lost forever. Much to the relief of art historians, the cathedral's three famous rose windows have survived the fire. THE LONDON GROUP will be meeting on Saturday 11th May from 11.00am to 4.00pm at the Calthorpe Arms, 252 Grays Inn Road, London WC1X 8JR The feature display will be ‘150 years of French Congo’ in the morning and after lunch, members are invited to show their own material (any topic). will be holding its next meeting on Saturday 13th July at Broom Methodist Church, 195 Broom Lane, Rotherham, S60 3NW from 10.30am to 4.30pm. The venue is only five minutes from Junction 33 on the M1. It will be the traditional Bastille Day meeting at which the feature display will be ‘Insuffciently paid mail’ with the afternoon being devoted to members’ displays (any topic). Lunch will be at the local pub. THE WESSEX GROUP will be holding its next meeting on Saturday 6th July at the Scout Hall, Lower Street, Harnham starting at 10.30am where the feature display will be ‘Mandates of Syria and Lebanon WW1’. After lunch, the afternoon will be devoted to members’ displays. On 26 October 2019 where the feature display will be ‘French Air Mails’. It would help if those planning to attend could let the appropriate convenor know - datails for whom are here. VISITORS are most welcome at all meetings - please check with the appropriate convenor before hand to a) confirm time and address and, b) to introduce yourself.